Aleocharine staphylinids are notorious for their taxonomic difficulties. The structure of their mouthparts have been treasured by taxonomists for their systematic utility, but compared with other beetles, aleocharine mouthparts are quite uniform and variations are subtle. Still, these beetles have managed to co-opt existing features to tackle a diverse array of diets. Although aleocharines are thought to be ancestrally predacious, it is becoming more apparent now that many of them dabble in microphagy. Microphagy is a dietary classification based more on the size of food items as opposed to the composition, but usually has a strong mycophagous component (feeding of various fungal products). 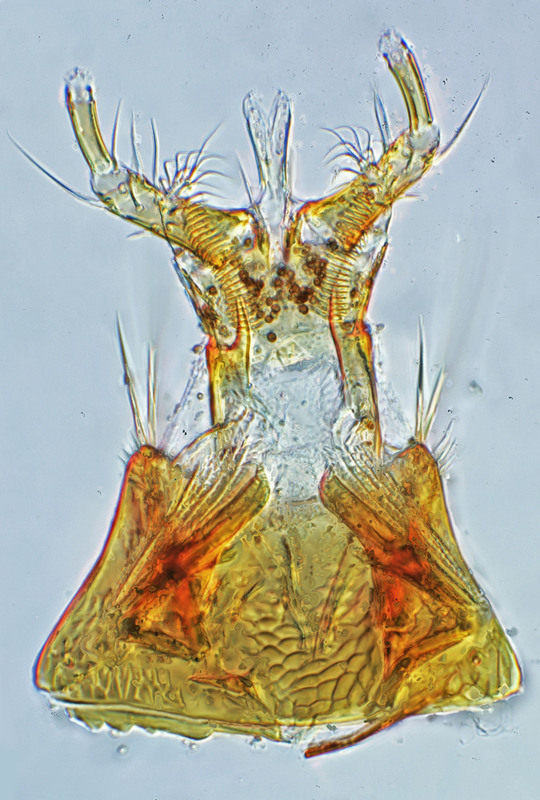 Although drastic changes don’t seem to be necessary for a general microphagous diet, there are some challenges that these beetles face and can be observed in the morphology. With such small food particulates and no spoon or dexterous hands, these beetles must find another way to direct their food into their gut. Coenonica puncticollis is a species that has been widely disseminated along with agricultural exports. There are records of them from Caribbean sugar cane in Florida as early as the 1940’s. Here you can see the labial complex of an individual that was in the midst of a tasty meal of spores. You can see the hypopharangeal lobes are used to channel the spores further back into the mouth so they may be triturated between the textured hypopharynx and ventral surface of the mandible. Coenonica puncticollis probably feeds on moulds that develop on plant material, such as slash from sugar cane plantations.